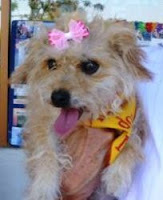 Shaggy 3 year old Maltese/Poodle (a maltipoo) mix! Shaggy is a perfect little gentleman ~ very calm and well-behaved. Annie This cute, loving puppy is absolutely adorable ~ perfect choice for a fun companion dog.